Parsley Patterson’s first year of high school is not turning out as she’d expected. Targeted by Danielle and her group of ‘mean girls’ who Parsley dubs The Blondes, she is picked on for her name, her hippie family and her Possum Creek address. But just as she decides to keep her head down and try to ignore it until it all blows over (or she finishes high school, whichever comes first!) her father’s announcement causes the spotlight to rest firmly on Parsley again. Locked in a fight with the local council over the right to hold a market day, Parsley’s parents have decided to ‘drop out of the nation’ and form their own Principality of Possum Creek. This makes Parsley and her sisters Sage, Rosemary and Thyme, all princesses. 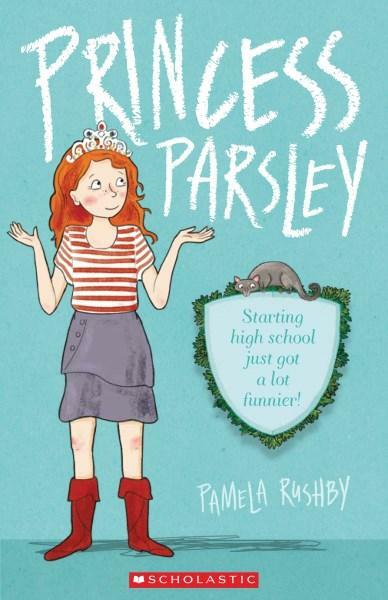 If Princess Parsley is going to survive even the first year of high school she is going to need to form a strategy. From the title, front cover and blurb I was expecting a cute story about fitting in at high school, but what I got was much more solid and thoughtful. The storyline often went in unexpected directions and the way in which Parsley tackled the bullying problem was novel. The serious themes of bullying and politics are balanced with Parsley’s humour. She has a unique way of looking at the world and of approaching her problems. Her drama teacher harnesses this by encouraging her to try stand-up comedy as an outlet for her frustration and embarrassment. 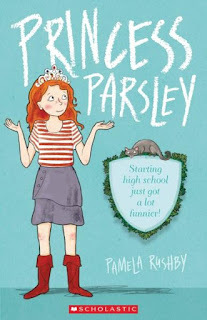 Princess Parsley is an entertaining and engrossing read, with a dash of interesting political information thrown in as well. There is something fascinating about Principalities, how they work, and the reasons people have for forming them. The characters are fun - even the ‘mean girl’ Danielle is portrayed sympathetically and is not just a two dimensional foil for the heroine – and this is a well written tale which is hard to put down before reaching the satisfying ending.